My main website is MrWilliamsburg.com , head on over there to get all the current news and updates on homes and communities in the area.. Details are still being added but here are the main special event announcements for the 2017 Busch Gardens Williamsburg season. Concerts are back this year with Summer Nights Concert Series featuring popular rock, pop, country and contemporary Christian performers live under the stars in the Royal Palace Theatre. Confirmed acts so far include 38 Special, Josh Turner, MercyMe, and, with additional names to be announced. Concerts are free with park admission. I just got back from a construction tour of Invadr, Busch Gardens Williamsburg newest ride and the first wooden roller coaster at the park. Remember riding a wooden roller coaster as a kid ? Well Busch Gardens is hoping to recapture that feeling. 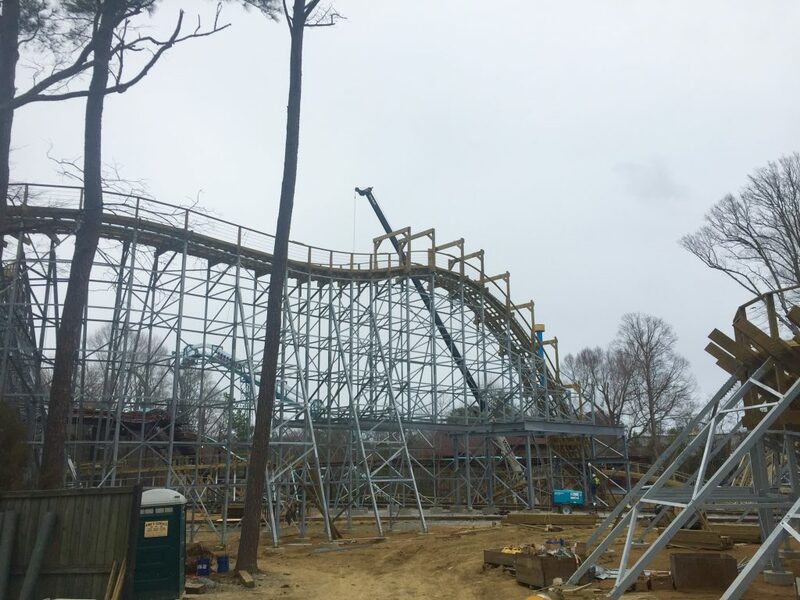 “Nothing feels like a wooden coaster ” said Adam House with Great Coasters International the PA based contractor Busch Gardens partnered with to build InvadR. The wooden roller coaster will include a 74-foot drop through two tunnels, nine hills and two tunnels. Top speed will approach 50 mph. And its all gravity powered. I have to admit when I heard it was a wood coaster I assumed the entire structure was wood. Not so, all the rails are wood but most of the structure is steel.. The trains, or frames, used to travel around the track on Gwazi at Busch Gardens in Tampa. After that ride was dismantled the cars were brought to Williamsburg last summer and completely stripped, inspected and updated to current technologies, with the added theming and comfortable seats, to produce a great ride on InvadR. Busch Gardens will host a pass-member preview day March 18 and will open to the public March 25. When looking at sales statistics for any market you really need to drill down into the specific price range to gain an in depth understanding of what is happening. As you can see in the chart below depending on the price range closed sales, number of homes on the market and pending sales are drastically different within the various price bands. These number reflect sales in the 23188, 23188 and 23168 zip codes which cover the areas of City of Williamsburg, James City County, Upper York County and the Toano areas. Does it seem like there aren’t many homes on the market ? That is a result of a dearth of listings. The number of homes on the market is down almost 30% over last year in the $200-$250k price range and between 9% and 160% in the $250k to $600k price ranges. As a result of low inventory overall sales are down slightly (3%) from last year. But sales in the 350-400k range are up 30.8% and 50% in the $600k to $750k range. Home sellers and buyers are basically on an equal footing when supply equals demand. The magic number, many housing experts say, is six. As in, "it’ll take six months to sell all the homes now on the market at the current pace of sales." In Williamsburg we are basically there in the under $400k market. Above that we still have a ways to go with inventories ranging from 10 months of supply in the $500-$600k range and as high as 22 months in the $750k + price range. One last note I am happy to report. 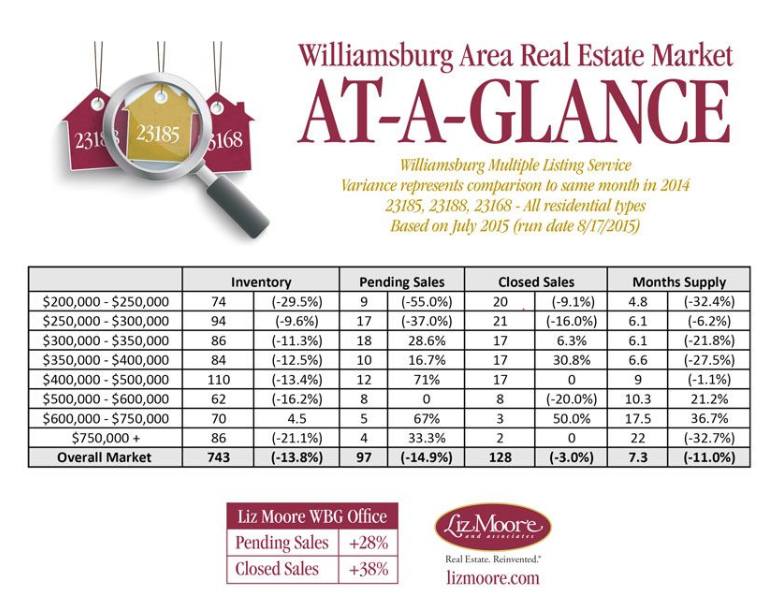 Although sales for the year are down slightly in the overall Williamsburg VA real estate market our company ( Liz Moore and Associates) continues to lead the market in sales. Our companies sales are up 38% over last year. We lead the area in sales and sell one in six homes in the market. psst … I’m a Realtor! Thanks for stopping by my website. I would love to help you find your dream home and community in the Hampton Roads or Williamsburg area or to sell your existing home.If you’re a Williamsburg or Coastal Virginia home seller who has been wondering if it might finally be time to sell, email me at John@MrWilliamsburg.com , and I can prepare a complimentary analysis of market value for you – you just may be pleasantly surprised. This post was authored by local resident and REALTOR, John Womeldorf. John is known around town as Mr. Williamsburg, for both his extensive knowledge of Hampton Roads and the historic triangle, and his expertise in the local real estate market. 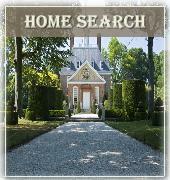 His websites,WilliamsburgsRealEstate.com and Mr Williamsburg.com were created as a resource for folks who are exploring a move toWilliamsburg, VA , Hampton Roads VA and the surrounding areas of the Virginia Peninsula. – Busch Gardens’ newest thrill attraction, Tempesto™, debuts April 25 at Busch Gardens. Park President Carl Lum announced the launch coaster’s name, its key features and its opening date during a special pass member preview day held March 21. Now through March 31, the Williamsburg parks are offering a great deal to enjoy Tempesto over and over with a 2-Park Fun Card. For just $75 – the same price as a one-day ticket to Busch Gardens – guests receive unlimited admission to both Busch Gardens Williamsburg and Water Country USA through Sept. 7.The offer represents a 25 percent savings off the regular price of a 2-Park Fun Card. For more information, visitwww.buschgardens.com/va.